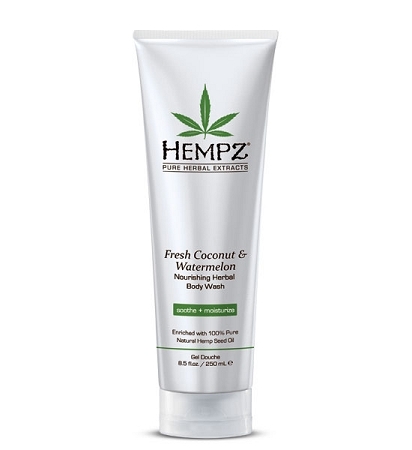 Hempz Fresh Coconut & Watermelon Nourishing Herbal Body Wash is enriched with 100% Pure Natural Hemp Seed Oil and infused with our signature blend of soothing Omega rich Vitamin E, calming Chamomile and Avocado Extracts and hydrating Coconut Oil and Watermelon Extract to help Nourish and moisturizer skin. Coconut Oil nourishes, moisturizes and helps protect skin while anti-aging properties help regain a youthful glow. Rich lather gently cleanses, softens and calms skin.